Chocolate Covered Caramels are soft, chewy, and PERFECT for the holidays, made with sugar, butter, vanilla, and heavy cream, then coated with sweet chocolate. 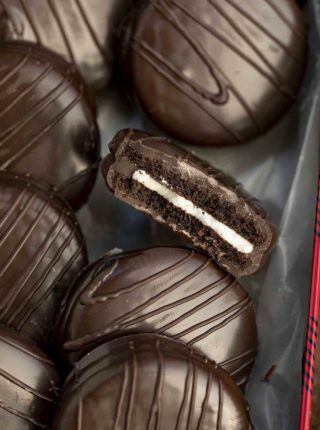 We’re gathering all of our favorite Valentine’s Day desserts this week, and right now we’re loving these Oreo Balls, Chocolate Covered Strawberries, and Chocolate Truffles! Chocolate Covered Caramels are sweet and chewy, and a fun dessert to make at home. This recipe uses a combo of sugar and corn syrup, mixed with cream, vanilla, and butter, then hardened, cut into pieces, and dipped in melted chocolate. It’s the PERFECT candy to give out as gifts, and my go-to when I need something sweet to serve at a party. 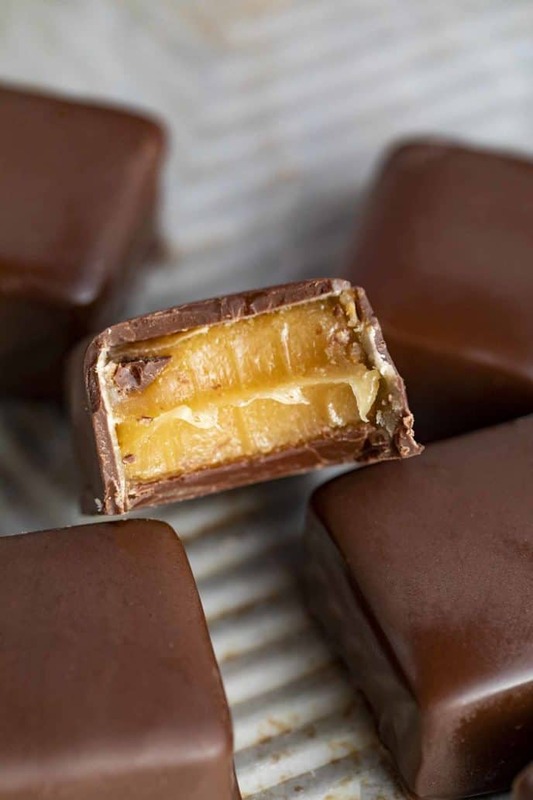 You can coat these soft caramels with semi-sweet dark or milk chocolate, and top with sea salt, sprinkles, or drizzle decoratively with extra caramel. I like to serve these with chocolate dipped homemade marshmallows! Chocolate caramels can be stored in an airtight container at room temperature. Try to avoid keeping them in areas that are very warm, like in the sunlight near a window, because they can melt. 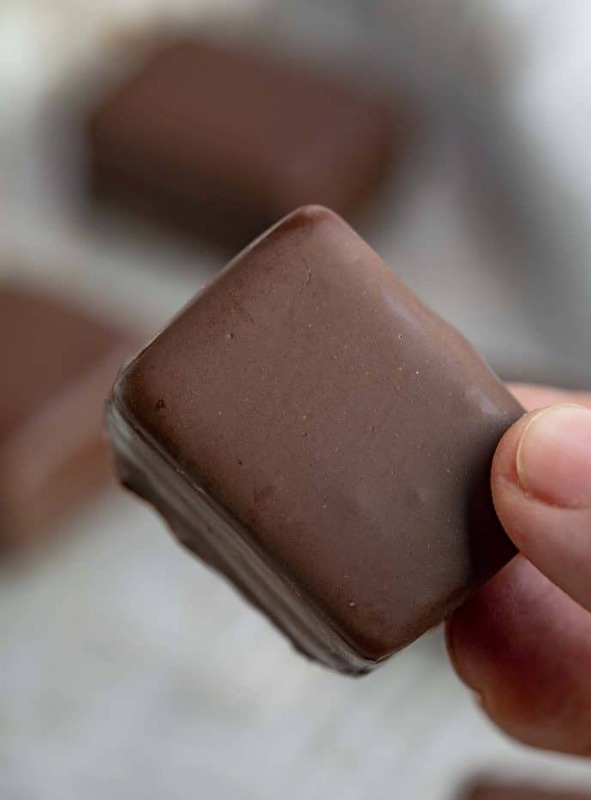 You can also refrigerate or freeze these chocolate caramels, but keep in mind that the chocolate can form condensation. 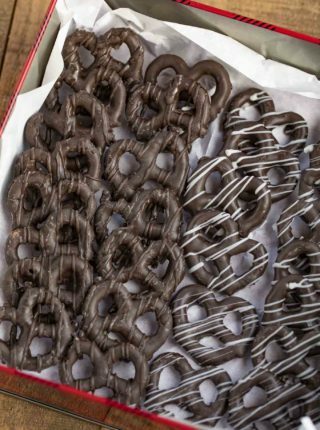 If you plan on serving these at a party or giving them as gifts, I would avoid the cold temperatures. HOW LONG DO CHOCOLATE COVERED CARAMELS LAST? Chocolate caramels will last for 2-3 weeks when stored at room temperature. Use wax or parchment paper, if you haven’t used candy wrappers, to keep the caramels from sticking to each other. Try making a different variation of these caramels with white chocolate, for white chocolate covered caramels! Use red sprinkles for a holiday version. 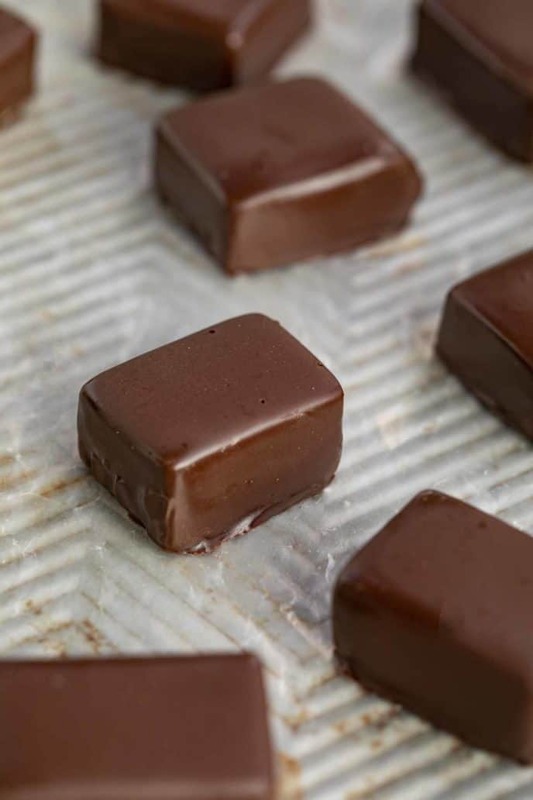 You can top these chocolate caramels with sea salt, or fleur de sel. Use plastic or paper candy wrappers to wrap the individual candies. You can give them out as Valentine’s Day gifts! You can replace the heavy cream in this recipe with whipped cream or unsweetened condensed milk for a richer caramel recipe. Use a candy thermometer to make sure your caramels turn out with the right texture. Making caramel depends a lot on the temperature of the melted sugar, because sugar will react differently when it’s melted and brought to different temperatures. I don’t recommend using chocolate chips in place of the chocolate disks. The disks will turn out smoother, and look better on the caramel candy. Try to find a candy thermometer that clips to the side of your saucepan to make things easier. 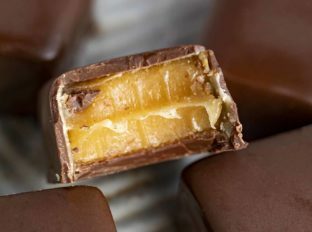 These caramels would work with salted butter or unsalted butter, but I prefer to use unsalted so I can control the amount that goes into this recipe. You can use granulated sugar or brown sugar, but keep in mind that the brown sugar will add a molasses type flavor to your chocolate caramels. Parchment paper will be your best friend here. Line your baking sheet with parchment paper or wax paper to keep the caramel from sticking. Add the sugar, heavy cream, corn syrup, butter and salt to a dutch oven (with a candy thermometer attached) on medium heat, whisking well until it comes to a boil, then lower the heat to medium low, whisking well until it reaches 245 degrees. Turn off the heat and whisk in the vanilla extract then pour it into the baking pan and let it harden for 4-6 hours before cutting. Place the caramels in the refrigerator for an hour before dipping to help keep them from melting before dipping. 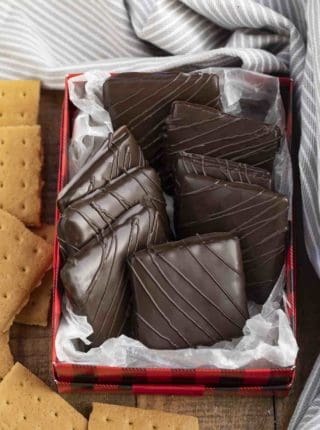 Melt the chocolate disks in 30 second increments until completely smooth then with a fork dip then dip them into the chocolate and place them on a sheet of wax paper or parchment paper to harden. These caramels look perfect especially for someone with a sweet tooth like me. It would be great to give as a food gift! I actually love giving these as client gifts! And you can decorate with a bit of melted chocolate drizzled over the top too for an easy decorative touch too! Oh my gosh, I want 20 of these! They look so perfectly shaped and so delicious. 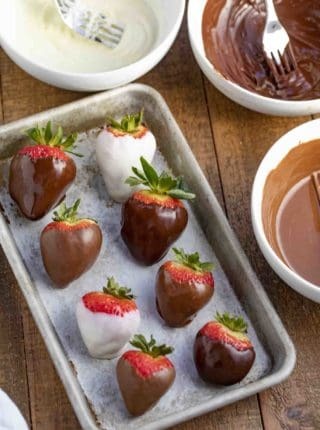 Lovely for a chocolate-filled Valentine’s Day! Oh my goodness these caramels look amazing! So happy to find this recipe. I was looking for Valentine’s Day desserts and I’d love to make these. Oh wow, I love chocolate and caramel together but never thought of making them myself. Your chocolates look amazing perfect for Valentines Day. So sorry about that. I’ve edited to read correctly now in the recipe card. Thanks for catching that!